In this post series, I show you how to display a simple list with a flight schedule. I also show you the most common ALV settings that you might need. However, I don't show you how to handle events in CL_SALV_TABLE, and how to add custom buttons at the top of your ALV. But, I have good news for you! I re-wrote the complete source code in OO ABAP way with the help of the 7.4 language elements. In the previous post, we successfully performed some individual column settings, like hiding unnecessary fields, and changing the text of some fields. So now, we have a good-looking ALV list, but we cannot say that our ALV is strong in functionality. So today, I going to share with you that how we can add additional functionality to our toolbar on the top of the list, beside the existing layout settings. To bring it to life, today we are going to use the class, CL_SALV_FUNCTIONS_LIST that is responsible for customizing the toolbar. Using this class, we are able to create custom functions and add it to the toolbar, or we can use standard ones, like sorting, filtering, and so on. In this demo, I am going to show you, how to enable the standard toolbar. As always, we are going to create a new subroutine for our next setting, called SET_TOOLBAR, and place its perform call in the usual INITIALIZE_ALV subroutine. DATA message   TYPE REF TO cx_salv_msg. The SET_TOOLBAR subroutine is going to be very easy, we need only 3-4 lines of code to implement it. 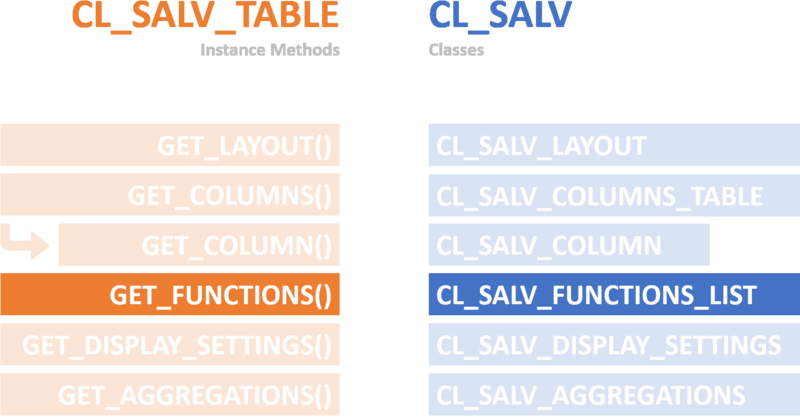 First, we are going to use the GET_FUNCTIONS() method of the CL_SALV_TABLE class that returns back a reference to its CL_SALV_FUNCTIONS_LIST object. Then, we are going to save this reference into a variable, called functions with the type CL_SALV_FUNCTIONS_LIST. At last, we call the method SET_ALL() on the previously initialized functions reference variable that is responsible to set all of the standard ALV functions in our toolbar. DATA alv     TYPE REF TO cl_salv_table. DATA columns TYPE REF TO cl_salv_columns_table. DATA column  TYPE REF TO cl_salv_column. DATA flight_schedule TYPE STANDARD TABLE OF spfli. SELECT * FROM spfli INTO TABLE flight_schedule UP TO 100 ROWS. DATA layout_settings TYPE REF TO cl_salv_layout. DATA not_found TYPE REF TO cx_salv_not_found. column = columns->get_column( 'MANDT' ). column = columns->get_column( 'COUNTRYFR' ). Stay tuned, I'm working on the next post!